Business and math and computer science students participated in career building activities including job shadowing, question and answer sessions and human resource presentations during a field trip to the St. Louis Boeing Company facility Feb. 19. Eighteen students were accompanied by Jon Beck and Alan Garvey, associate professors of computer science, and Renee Wachter, dean of business. 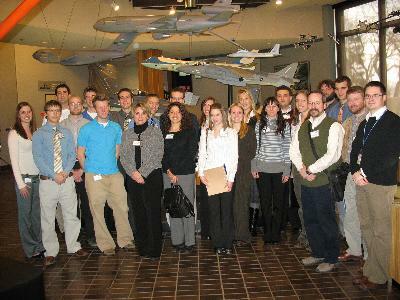 The group was hosted by various Truman alumni who work for Boeing, which employs nearly 240 Truman graduates. The company has been very supportive of the University’s business and math and computer science divisions through making substantial contributions to grant and scholarship programs. The trip was partially funded by the Truman STEP program for talent and expansion in the science and mathematics disciplines. Pictured are Truman students, faculty and alumni who participated in the Truman Visit Day at Boeing Company in St. Louis Feb. 19. 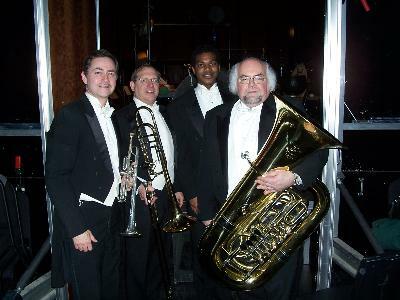 Pictured, from left to right, Gregory Jones, Jay Bulen, Kevin Harrison and Steven Seward stand backstage at the Lyric Theatre, home of the Kansas City Symphony in Kansas City, Mo. The University’s tuba professor, Steven Seward, is the Kansas City Symphony’s principal tubist. He was joined by fellow Truman faculty Gregory Jones, trumpet, and Jay Bulen, trombone. Kevin Harrison, a recent graduate of the Truman music program, also performed during these concerts under the direction of maestro Michael Stern. Each performance was met with standing ovations and many Truman alumni were in attendance to see their former instructors perform. Truman is well connected to the Kansas City classical music scene, as four Truman music graduates, Leigh Smith, Brad Fowler, Carol Carlson and Michael Harris work in the administration of the Kansas City Symphony as well. Applications are available in the Truman State University Financial Aid Office for the J. R. Popalisky scholarship Fund of the Missouri Section of the American Water Works Association. This $1,000 scholarship opportunity is available to civil or environmental engineering science students whom have an emphasis in career fields associated with water supply. The deadline for applications is Feb. 28. The Army Emergency Relief (AER) offers financial assistance for undergraduate study of dependent children of Army Soldiers. The MG James Ursano Scholarship Fund administered by AER is for students who study at an undergraduate, technical or vocational institution accredited by the U.S. Department of Education and approved for Title IV finds. Scholarships are awarded based primarily on financial need, secondarily on academic achievements and individual accomplishments. Students may obtain more information and apply online at http://www.aerhq.org by March 1. The Federated Garden Clubs of Missouri are offering several scholarships to Missouri students. Scholarships up to $1,000 are available for qualifying undergraduate and graduate students enrolled in Missouri colleges or universities who are majoring in horticulture, floriculture, landscape design, botany, plant pathology, forestry, agronomy, environmental concerns, city planning, land management or a similar subject. Visit the Financial Aid Office in McClain 103 for more information or to pick up an application. The deadline for these scholarships is March 1. Google has partnered with the Hispanic College Fund on a scholarship program for computer science and computer engineering students for the 2007-2008 academic year. Candidates must be junior, senior or graduate students pursuing a computer engineering or computer science major. Visit http://scholarships.hispanicfund.org/applications/subsectionID.1,pageID.123/default.asp for more information. Deadline for the application is March 15. Members of the Truman Forensic Union captured the Missouri State Championship in Debate Feb. 17. The Union left the Missouri Association of Forensic Activities (MAFA) State Championships at William Jewell College in Liberty, Mo., with two additional state titles and more than 20 individual awards. This was the first time since 2003 that Truman won the Missouri Debate “Sweepstakes” Championship, one of three state sweepstakes titles. Additionally, Truman was the runner-up to State Champion, Drury University, in the overall sweepstakes category, which combines scores in both debate and individual speaking events. Truman debaters dominated the competition. “In a sense, all four teams share the State Championship,” Kevin Minch, associate professor of communication and director of forensics, explained. The only losses Truman teams encountered in the elimination rounds were to other Truman debate teams. In those cases, the teams did not debate, instead those with the higher seed advanced to the next round. The team of Dylan Rothermel, a junior economics major from Homewood, Ill., and Mark Buchheit, a freshman history major from Carthage, Mo., closed out the final round of the Varsity Championship with fellow Truman debaters Trevor Alexander, a senior economics and English double major from Gladstone, Mo., and Stefani Wittenauer, a senior communication and political science double major from Bellevillle, Ill. The other two debate teams in the elimination round consisted of Sara Archer, a senior accounting major from Riverside, Mo., and Keith Schnakenberg, a senior communication and political science double major from Buffalo, Mo., and Kevin Haynie, a sophomore political science major from Bridgeton, Mo., and Christopher Girouard, a junior communication and political science double major from Chesterfield, Mo. Truman also represented five of the top six debate speakers honored at the competition. In Novice Parliamentary Debate, the team of Courtney Wallace, a junior nursing major from Philadelphia, and Stephanie Howes, a freshman political science major from St. Louis, fell in the semi-finals to the eventual State Champions. Archer had the same fate in the Lincoln-Douglas Debate competition, but was ranked the top speaker in that category. Truman was also a dominant force in the individual speaking events, comprising half the field in the final round of extemporaneous speaking. Rothermel took home the State Championship in the event, while Archer took third and Matthew Macari, a freshman computer science and mathematics double major from Peoria, Ill., took fifth. Macari also placed fourth in rhetorical criticism and was the top novice speaker in both events. Jessica Carr, a sophomore justice systems major from Park Hills, Mo., and Jamie Menown, a sophomore nursing major from Kansas City, Mo., took sixth in duo interpretation. The team closes out the invitational tournament season at Williamette University. The team will compete in two national championship tournaments in March, the Pi Kappa Delta Nationals and the National Parliamentary Debate Association Championships. For information on Truman Forensics, contact Minch at 785.5677 or kminch@truman.edu. The Truman State University Foundation will award more than $460,000 in scholarships to Truman students in 2007-2008. Applications are due by midnight March 1 and are available online at http://www.truman.edu by clicking on Current Students/Foundation Scholarships or log on to https://secure.truman.edu/isupport-s/. On the Web site, there are more than 365 scholarships advertised within the academic disciplines specifically for Truman students in 2007-2008. For example, the Carrie T. Nauyalis Communications Annual Scholarship was recently established for public communication and/or communication studies majors by Nauyalis, a 1994 graduate of Truman, in appreciation of her experience at Truman. There are also more than 125 scholarships listed in the General category, such as specific scholarships for first generation students, for students with physical disabilities and students with financial need. Private gifts from alumni and friends of Truman State University supplement state and federal appropriations and enhance the overall excellence of the University. The Truman State University Foundation has provided opportunities for thousands of alumni and friends to make an investment in students. President Barbara Dixon has approved continuing the tuition discount program for undergraduate on-campus 2007 summer classes. Designed to encourage enrollment by students seeking a double major, minors, or simply wanting to accelerate their progress, this program reduces per credit hour rates by 15 percent. Details on the new fee schedule are in the Summer Schedule of Classes and students will also be notified of this change by e-mail. The discount applies only to on-campus undergraduate courses, and excludes interim courses, graduate courses, and study abroad programs. Brett Rogers, a history professor at William Woods College, will speak on this topic. He has been doing research on African-American schools, churches and Freedman communities since the early 1990s. This colloquium is one of four required for credit in the IDSM 300 course. Contact Betsy Delmonico at bdelmoni@truman.edu or 785.4492 for more information. Eta Sigma Gamma is sponsoring a highway safety awareness campaign Feb. 26-28. Demonstration of what happens in an accident in which the driver and passengers are not wearing their seatbelts. Motivational speaker Penny Lorenz will speak about her personal experience in an automobile accident. The Center for Student Involvement is asking students to nominate the outstanding leader, organization or adviser in their life. Application packets are currently available in the Center for Student Involvement, located in the lower level of the SUB. The Leadership Recognition Program will take place at 7 p.m. April 11 in the SUB Lounge. Dereck Daschke will speak at the Northeastern Missouri Phi Beta Kappa Association lecture. In informal discussion will follow at Il Spazio. Appetizers will be provided. March 2 • 7:30 a.m.-6 p.m.
March 5-9 • 8 a.m.-5 p.m.
March 2 • 6:30 a.m.-7 p.m.
March 5-9 • 11 a.m.-2 p.m.
March 11 • 4-7 p.m.
Truman Today podcasts are now available for free subscription and download on iTunes. New episodes are posted on the Tuesdays of each week during the academic year. The Graduate English Organization (GEO) is currently seeking proposals for the presentation of papers, commentary, criticism, studies, articles and readings of creative works covering the topic of “Taboo” for the conference. The deadline is March 9. Submit a one to two paragraph abstract to mmayhan@truman.edu with “Shake Your TABOOty” in the subject line. Visit http://gradeng.truman.edu for more information. Forms are now available online at http://odk.truman.edu or at the Student Affairs Office. The Hall of Fame was established with the help of Omicron Delta Kappa Leadership Society in order to recognize employees and students who have made outstanding contributions to the University. Award recipients will be recognized at the Leadership Recognition Banquet April 11. The SAA will award two $200 scholarships to students who display leadership and the drive to become productive Truman alumni. Applications are available online at http://saa.truman.edu or at the Advancement Office in McClain Hall 101. Contact Becky Hadley at bhadley@truman.edu or Greg Xander at gregx@truman.edu for more information. Win $500 or a trip to Washington, D.C. Discover new interests and insights into Abraham Lincoln as a person through art, essay or oration. Art work may be submitted in any medium to Rusty Nelson, associate professor of art. Contact Nelson at 785.7332 for criteria and more information. Two to 10 page essays should be submitted to Chett Breed, professor of English. Contact Breed at 785.5981 for more information. Six to eight minute speech manuscripts should be turned in to Barry Poyner, professor of communication. Contact Poyner at 785.4063 for more information. Ben Coate, a junior political science and Spanish double major from Chanute, Kan., and Ryan S. Lewis, a senior history major from Chesterfield, Mo., presented their paper, “Eye of the Beholder,” at the “Miscarriages of Justice” conference Feb. 20 in Warrensburg, Mo. The paper, coauthored by professor of political science Paul Parker, analyzes reported reactions of defense and prosecuting attorneys to death penalty reversals. Barbara Price, associate professor of English, attended the Write to Learn/Missouri Association of Teachers of English (MATE) conference Feb. 16 and 17 in Osage Beach. Also attending were Truman graduate students Crystal Buffaloe, Kara Burns, Nick Kremer, Sarah Maddox, Be-Asia McKerracher and Laura Trieschmann. MATE awarded Buffaloe the 2007 Robert J. Greef Award as outstanding English education student from Truman. Truman M.A.E. graduate Kelli Best-Oliver (2004) presented a session describing changes she, Tom Harper (2004) and other Maplewood-Richmond Heights teachers have made in their school’s writing program. Lucy Lee, professor of Spanish, was recently named the first member-at-large of the National Executive Committee of Sigma Delta Pi, the national collegiate Hispanic honor society. Lee will now participate in all processes requiring action by the Executive Committee and her term of office is for a complete triennium with possibility for re-appointment. She was chosen based upon her exemplary service in Sigma Delta Pi as Truman’s chapter adviser (1989-present) and as the vice president of the Southwest region (2001-present). Mark Spitzer, assistant professor of English, recently had his essay/review “Fear and Loathing in Polemics: The Unfortunate Butchery of Hunter S. Thompson’s Amazing and Draining Künstlerroman” accepted and published in the latest Del Sol Review. High school academic teams from across the state competed in the Academic Competition Organization’s (ACO) NERD Bowl Feb. 17. First place in the large school division went to Savannah High School with Smithville High School placing second. In the small school division, Scotland County High School and Knox County High School took first and second places respectively. ACO would like to thank Tau Lambda Sigma members Kara Fleming, a freshman German major from Louisburg, Kan.; Kim LaTendresse, a freshman from Grundy Center, Iowa; Heather Mallett, a sophomore art pre-M.A.E. major from New Cambria, Mo. ; Christa Manton, a sophomore biology major from Linn Creek, Mo. ; Kayla Riekena, a junior business administration major from Chillicothe, Mo. ; and Amanda Stukenbroeker, a freshman German and Russian double major from St. Louis; for volunteering their time to assist with the tournament. ACO would also like to thank the other women of TLS as well as the women of Alpha Sigma Gamma who volunteered but whose assistance was not needed because of cancellations due to weather. The 2007-2008 Free Application for Federal Student Aid (FAFSA) is available online at http://www.fafsa.ed.gov. Apply soon to be considered for all available federal and state funds. Visit the Financial Aid Office in McClain Hall 103 or call 785.4130 for more information. Truman is one of more than 200 schools participating in RecycleMania 2007. Truman was ranked 15th after the third week of RecycleMania competition. University community members can still participate by recycling paper, plastic, aluminum cans, cardboard and glass at Truman’s Recycling Center. First-year Activities Coordinating Team (FACT) applications are now available in the Center for Student Involvement (CSI), located on the lower level of the Student Union Building. The applications are due to the CSI by 5 p.m. March 2. The 2007 FACT members will receive a small stipend or scholarship hours for the fall 2007 semester. Call the CSI at 785.4222 for more information. Cap, gown and graduation announcements for May 2007 graduates can now be ordered through the Truman Bookstore until March 5. Log on to http://truman.bkstore.com for more information. Fall 2007 Writing Consultant applications are now available from the Writing Center in McClain Hall 303. Call the Writing Center at 785.4484 for more information. One Acts Festival Auditions will take place from 7-10 p.m. Feb. 27 in Severns Theatre. Students may audition for six student-directed one-act plays. They should prepare a one-minute long performance. The performance can include singing, dancing or reading. Contact Jeff Sanders at 573.424.7044 or jds733@truman.edu for more information. The Weekly Lunch Series continues with “How to Make Group-Work Work,” from 12:30-1:30 p.m. Feb. 28 in the Student Union Building Alumni Room. FAC is accepting new members. Applications can be picked up in the SUB office and are due at 4 p.m. Feb. 28 in the SUB office. The Free Software Club of Kirksville will meet at 6 p.m. Feb. 28 in Violette Hall 1220. They will discuss and learn about computers and free and open-source software. E-mail Jason Novinger at jnovinger@truman.edu for more information. What’s Rotaract? There will be a Rotaract informational meeting from 7:30-8:30 p.m. Feb. 28 in Baldwin Hall 346. Rotaract focuses on international awareness, personal development and building leadership skills. Rotaract is involved in many service projects as well. Come and learn more, refreshments will be provided. Contact Matthew Thiele at Rotaracttsu@truman.edu or 573.639.0748 for more information. There will be a P.A.T.C.H. secondary informational meeting from 8-9 p.m. Feb. 28 in Magruder 2050. P.A.T.C.H. is a support organization for students, faculty and staff with incurable illnesses. Contact Lindsay Rudolph or Jeffrey Eaton at patchtsu@gmail.com or at 785.5837 for more information. Short on time? The Student Recreation Center is presenting “Less Time & More Benefits” from 6:30-7 p.m. March 1 in the SRC Conference Room. The informative workshop will address efficient use of time set aside for exercise and demonstrate how prolonged exercise is not necessarily more beneficial. Contact Karen Skoch at kbskoch@truman.edu or at 785.7739 for more information. Omicron Delta Kappa applications for spring 2007 are due March 1. There will be two IT-HOW-2 workshops in the next few weeks. A basic photo editing class will be from 10:30 a.m.-noon March 2 in Pickler Memorial Library 103. A basic Web page editing class will be from 9:30-11 a.m. March 16 in Pickler Memorial Library 103. People can find out more information and sign up for the classes at http://its.truman.edu/register or at http://its.truman.edu/techbreak. The University Society of Middle Eastern Dance (USMED) presents the Kami Liddle Belly DanceWorkshop and Show March 11 in the Pershing Building small gym. Registration will be from 1:30-2:30 p.m., the workshops will run from 3-7 p.m. and the show begins at 8 p.m. The workshop costs $65 in advance and $75 at the door, with a $10 discount for the members of USMED. The show is absolutely free. Contact Ashley Tomten at TrumanUSMED@gmail.com or at 636.219.6805 for more information. The Student Recreation center is sponsoring MyPyramid Eating Guidelines Presentations March 12 and 19 from 4-4:30 p.m. in Pickler Memorial Library 103. Come learn how to use the online MyPyramid Tracker. It can help the user choose the foods and amount that are right for them. Contact Karen Skoch at kbskoch@truman.edu or at 785.7739 for more information. Have you ever been to China? Students interested in a semester abroad teaching English as a second language in the Peoples’ Republic of China can attend an informational meeting at 7 p.m. March 13 in Violette Hall 2351. Contact Jan Grow at jgrow@truman.edu or Timothy Farley at tfarley@truman.edu for more information. Donate your formal wear and win an iPod! The National Society of Collegiate Scholars is collecting gently used formal dresses so that underprivileged girls can attend their senior prom. Collection will take place from 12:30-3:30 p.m. March 13-15 on the Student Union Building main floor. 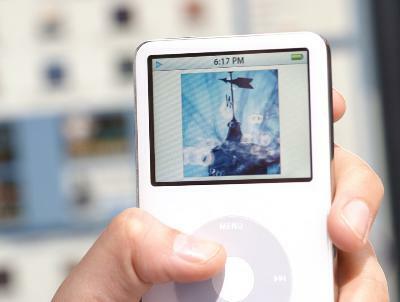 Each person who makes a donation will be able to enter a drawing to win a new iPod shuffle. Contact Amanda Hopkins at anh130@truman.edu for more information. The Center for Teaching and Learning presents a Global Issues Colloquium at 7 p.m. March 15 in Magruder Hall 1000. Charles Frost, professor emeritus of criminal justice, will speak on the topic of “Analysts, Politicians, Spies and the National Intelligence Estimates.” Contact Julie Lochbaum at ctl@truman.edu for at 785.4391 for more information. The kick off event for team-captains who are participating in the third annual Kirksville Heartwalk will be at 5 p.m. March 15 in the Student Recreation Center. Help with online registration and team packets will be given out. Go to http://www.heartwalk.kintera.org/kirksville for more information.